One week after four federal judges partially dismantled Donald Trump’s Muslim ban by ruling that detainees in U.S. airports must be immediately released, a fifth federal judge has now taken things much further. After the state of Washington sued Trump in federal court, U.S. District Judge James Robart ruled today that visas must be immediately restored to those Muslims whose visas had been taken away during Trump’s racist crackdown. And somewhat predictably, Trump is going berserk over it. While the initial court ruling against Trump’s Muslim ban had come at the hands of the ACLU, today’s ruling came at the hands of Washington State Attorney General Bob Ferguson with assistance from the state of Minnesota. The judge stated that Trump had caused “immediate and irreparable injury” with his ban. While the Trump administration can and will push back in court, it means that – for now – Trump’s controversial and unpopular Muslim ban is dead. 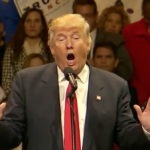 Naturally, the reaction from Trump’s corner was borderline berserk in nature. Perhaps sensing that the ruling was coming today, Donald Trump tweeted this afternoon that “We must keep ‘evil’ out of our country!” without bothering to define who or what was supposed to be “evil” in his estimation. Trump has since said nothing since the judge made his ruling, instead of leading press secretary Sean Spicer to post a series of harried tweets on his behalf. We’ll leave it to you to make sense of Spicer’s rambling, which seems rather clearly posted at the behest of a berserk Donald Trump, whose aides are likely holding him back from his own Twitter account as we speak. But the bottom line is that Trump is losing this Constitutional fight and he knows it.